Festival season is upon us, and it’s our favourite time of the year! Flower crowns summed up last year’s festival look, but this year is all about glitter, vivid hair colour, space buns, braids and hair charms! If you are like us, you have dusted off your wellies and have planned your looks for each day – each outfit demands a killer hair trend! 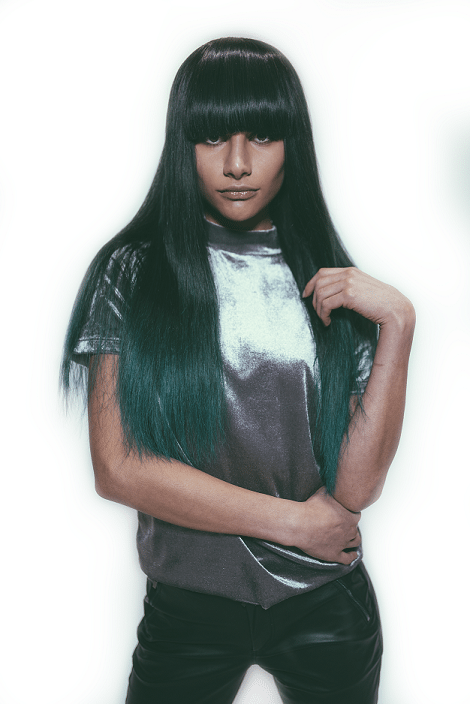 Mattia at Live True hair salon Clapham has styled this year’s must-have festival looks, so you are a fashionista throughout the weekend! Before you start packing your bags, pre-treat your hair! A deep conditioning treatment, or an Olaplex hair service, will add moisture back to the hair and leave it looking healthy and glossy! Say goodbye to dull and dry hair! For tips on how to add life back into your tresses and protect your hair, read our hair detox tips. How do you keep your hair looking good throughout the festival weekend without showers or straighteners? We suggest you pack dry shampoo and hair spray! Your hair essentials! As the days pass, apply dry shampoo to extend your blow dry, to get rid of a greasy fringe or to add volume to your locks at the end of each day! Hairspray will also become your best friend to style those braids and up do’s well into the weekend. When it comes to hair colour, the bolder the better! 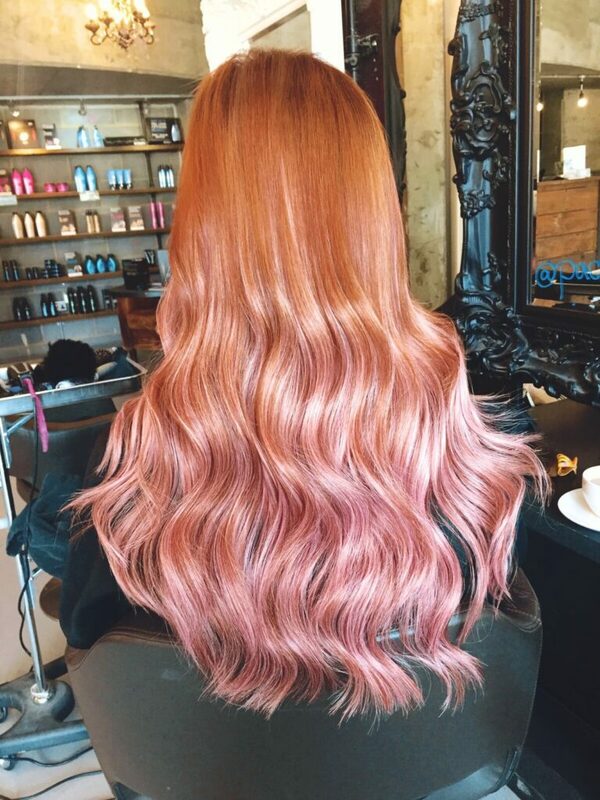 Vivid hair colour has become a popular trend! Shocking pink to pastel lavender locks have been seen from the catwalk to the streets. Why not try a pink balayage, a dip-dyed green or a green ombré? For more colour ideas, read our blog post on rainbow hair, unicorn hair and mermaid hair. 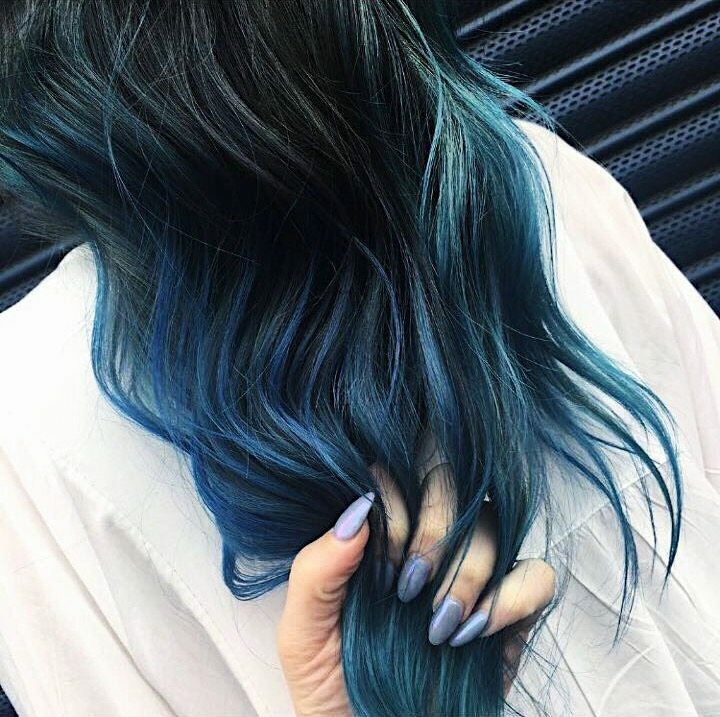 If you don’t want to permanently change your hair colour and would rather experiment with a splash of colour, think about adding vibrant or pastel hair extensions to your tresses. If you want to add colour to your hair, but aren’t bold enough to rock vivid hair colour, why not try a balayage or an ombré to provide a golden hue this summer and brighten your face. 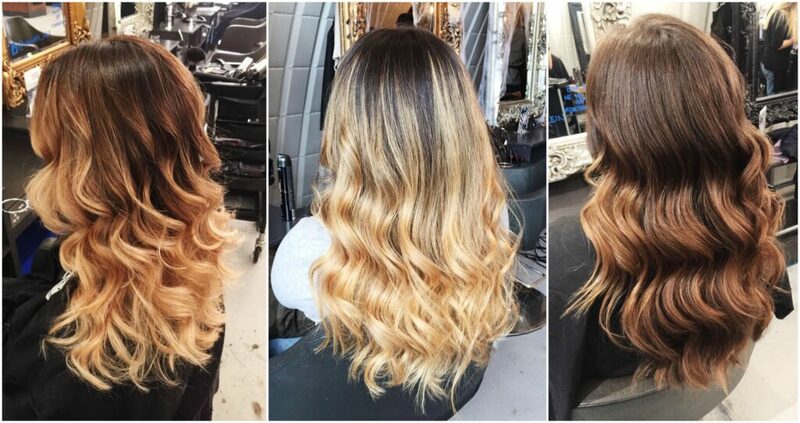 Balayage is a free-hand technique in which your colour is painted onto your hair to create a natural sun-kissed look. For more about this popular colour technique and why we love it, read our blog; Now Trending: Balayage. Ombré is the gradual lightening of the hair strand, from a darker to a lighter colour! Create a subtle ombré to light up your face, or raise eyebrows with a bolder lighter look. Visit one of our London hair salons and have a talented stylist create your ombré. Remember to protect your hair colour. Try not to stay in the sun for extended periods of time. If you are, why not protect your locks with a stylish bandana or sun hat! If you have just colour added to your hair, use a UV-protectant spray. This will ensure your colour holds and your scalp doesn’t burn. If you need more advice and tips on colour care, read our post on how to take care of your hair colour. 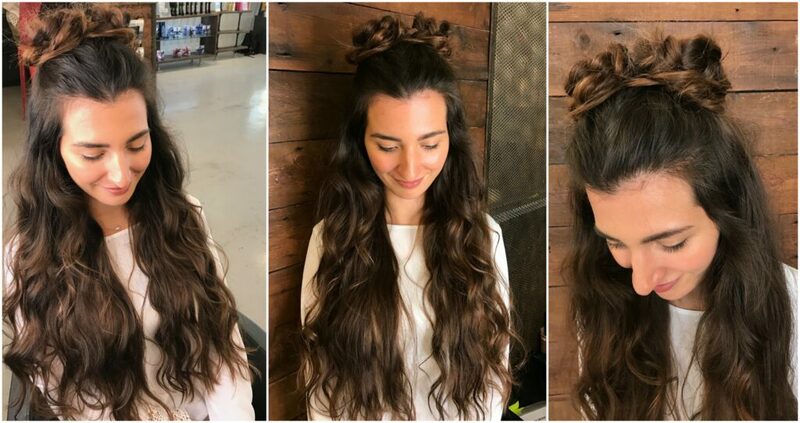 If you need to keep your hair out of your face or keep it back, as it is starting to look tired and not as fresh as when you arrived, braids are this season’s must-have festival look! We suggest you spray a soft conditioning spray over your tresses and then braid your hair. Sleep with it in then shake loose the next day for soft flat waves. 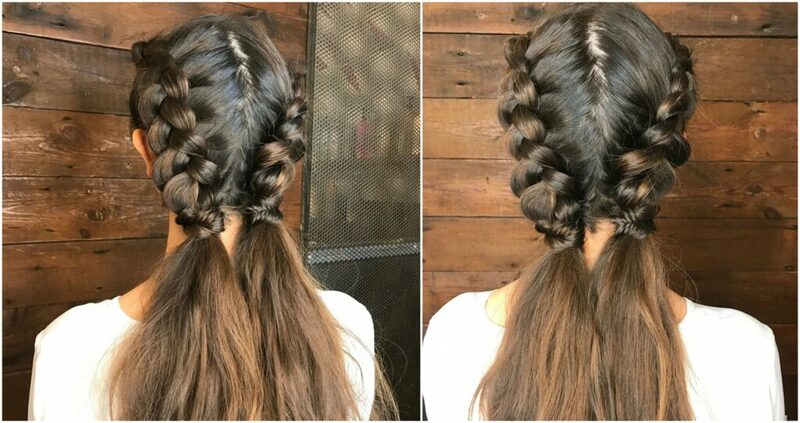 Double braids are a new take on the boxer braid. Boxer braids and cornrows are still hot on this year’s festival lookbook, but we are loving double braids. A gorgeous look that looks effortless and ever so stylish! Braided buns are a great half up – half down look. Separate the hair and comb the top half through. Part the top half of the hair into two parts using a fine-toothed comb. Braid each section and wrap into a bun and secure with a hair tie. Micro braids are a great way to add texture and movement to your hair. If you aren’t a braid queen but want to pull off this look, micro braids are an effortless look seen on the spring/summer fashion week catwalks. For more braid ideas, read up on the latest hair braiding trends. All that glitters is gold! Out with the flower crowns and in with the glitter, glossy eyelids and moon bags! 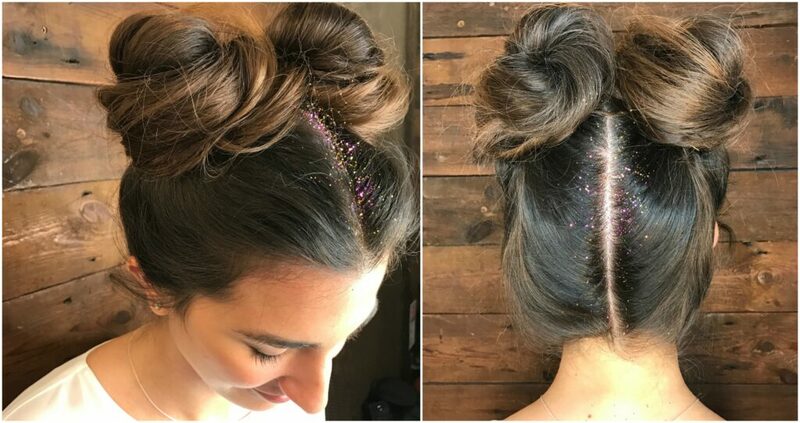 Get creative and glitterise your festival hair – it adds a fun element to your style and helps to disguise any frizz or greasiness! Apply glitter by spraying hairspray on the area you wish to decorate! As you spray, sprinkle your glitter to ensure it remains fixed to your hair throughout the day! 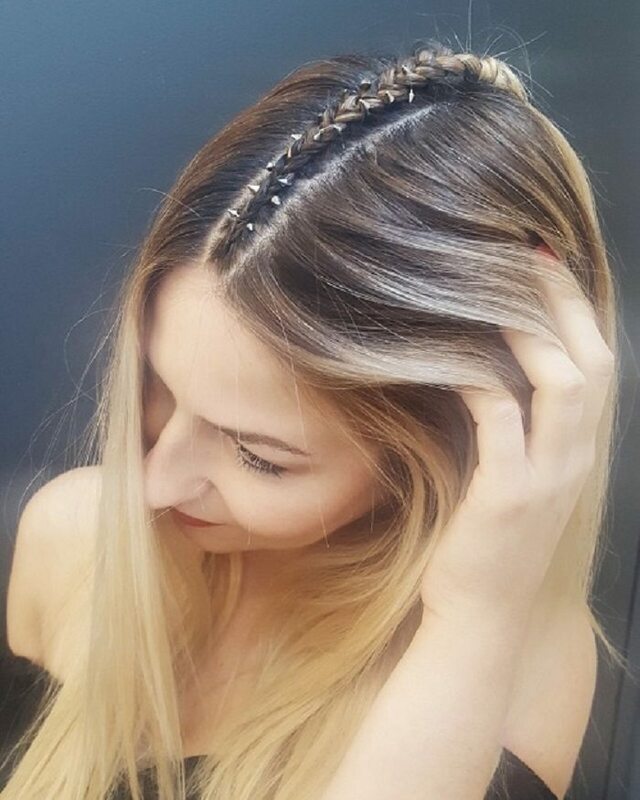 To jazz up any of your braided looks, or if your hair is too short for braids, dust glitter over your hair – a fun way to complete any festival look. Another popular hair trend, spotted at Coachella and on the catwalks, is embellished hair. Adorning your braids with trinkets, charms, gems and other metal favours has become a hair trend every IT girl is experimenting with! Choose your braid and weave in your charms as you complete your hairstyle. Trinkets add a pretty detail to your braid, while rings give you that edgier look. If you prefer effortless style and low maintenance, we suggest having a blow dry before you head off! Your blow dry will last for a couple days and can be maintained with dry shampoo. We love Redken Pillow Proof Dry Shampoo. Book yourself into a Live True London hair salon for your blow dry service, the day before the festival. Bouncy and voluminous or sleek and smooth! Sit back, relax, and have your bespoke blow dry created! Once you blow dry starts to look like it needs some life, we suggest space buns or double buns! 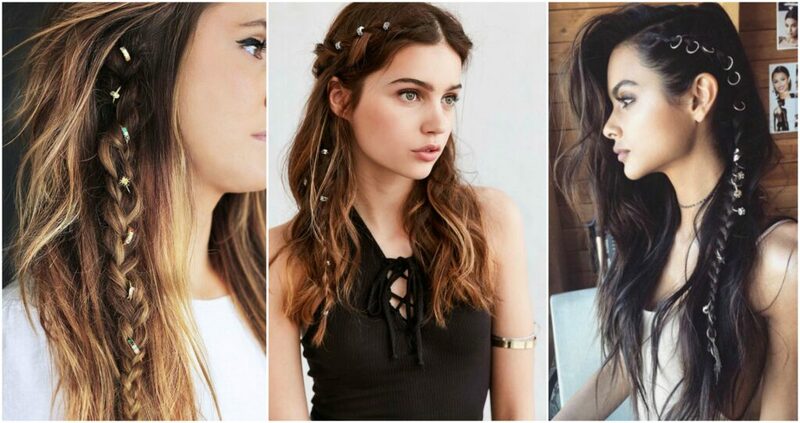 Whether you wear this look up or half up – half down, this is a popular hair trend you just need to wear at any festival! Chic and low maintenance, part the hair and tie each side up in a high pigtail. Create a messy bun with each pigtail, secure with hair clips and finish with hair spray. For a finishing touch, dust your parting with hairspray and glitter. Embellish your check bones with rhinestone decal to match your glitter dust! Book yourself in for a Brazilian Blow Dry if you are all about fuss free festival hair. If you need to fight the frizz or make your hair more manageable, a Brazilian Blow Dry is the answer! This Keratin hair treatment is a semi-permanent way to smooth and nourish your hair, leaving you with frizz-free manageable hair for up to 4 months. Come in for a free consolation with a stylist to discuss how your hair can benefit from a Brazilian Blow Dry and how it will leave you looking like a festival goddess. Once the dust has settled after your festival experience, it’s time to ensure you treat your hair so it’s back to looking healthy and feeling strong. We suggest using Redken Extreme or Redken All Soft products to combat dry and dull hair, and to provide you with that post-festival gloss and glow!